Caelifera is a suborder of the order Orthoptera, comprising "short-horned" orthopterans with the common names of grasshoppers and locusts, characterized in extant members by saltorial hind limbs (modified for leaping), antennae having less than 30 segments, and the absence of auditory organs on the prothorax. Although members of Caelifera are sometimes collectively known as grasshoppers, often this designation is limited to the "true grasshoppers" of the caeliferan family Acrididae, while the term short-horned grasshoppers is applied to members of the suborder to distinguish them from the "long-horned grasshoppers" of the orthopteran suborder Ensifera. The term locusts is not a formal taxonomic grouping but rather is applied to caeliferan species that exhibit a behavioral, morphological, and physiological shift from a solitary phase to a gregarious migratory phase. Ecologically, these almost exclusively herbivorous insects are integral to food chains, being consumed by a wide variety of vertebrates and invertebrates. In some places of the world, they also are eaten by people as a good source of protein. 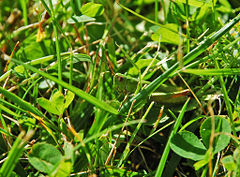 However, for many human beings, one of the chief delights of grasshoppers is the special wonder they add to nature, with their ability to produce sounds through stidulation, as well as their unique form and ability to jump long distances. Some species of grasshoppers, and in particular locusts in their swarming phase, can be very destructive to agricultural crops. As members of the insect order Orthoptera, caeliferans are characterized by chewing/biting mouthparts, incomplete metamorphosis (hemimetabolism), strong hind limbs, and two pairs of wings that are held overlapping the abdomen at rest. The forewings are narrower than the hindwings and hardened at the base, while the hindwings are membranous and folded fan-like under the forewings when at rest. Orthoptera includes two suborders, Caelifera (short-horned grasshoppers and locusts) and Ensifera (crickets, katydids, and weta). The Ensifera, sometimes collectively known as "long-horned grasshoppers" (Naskrecki 2004), are typified by antennae with many more than 30 segments and longer than the body, while the Caelifera have antennae shorter than the body. In evolutionary terms, the split between the Caelifera and the Ensifera is no more recent than the Permo-Triassic boundary (Zeuner 1939). Characteristics of Caelifera include having a short ovipositor in females that has four functional valves (versus the typically six-valved, sword-shaped ovipositor of female ensiferans); antennae with less than 30 segments; and if a hearing organ is present, such as a tympanum, it is found on the abdomen, on the sides of the first abdominal segment. Generally they are winged, but hind wings are membranous while front wings (tegmina) are coriaceous and not fit for flight. Females are normally larger than males. Males have a single unpaired plate at the end of the abdomen. Females have two pairs of valves ( triangles) at the end of the abdomen used to dig in sand when egg laying. Caelifera range in size form a few millimeters to more than 15 centimeters (6 inches) in length (Rowell and Flook 2001). Those species that make easily heard noises usually do so by rubbing the hind femurs against the forewings or abdomen (stridulation), or by snapping the wings in flight. This is different from the ensiferans who rub their tegmina against each other, with one tegmen (front wing) being a modified vein (the file) that is equipped with a file-like row of teeth, and this is rubbed against a modified vein, making a hardened edge, of the second tegmen (the scraper). The presence of the protein resilin in the back legs of grasshoppers is one reason that some can make repeated leaps of long distance, perhaps 8.5 feet (2.6 meters), without any sign of fatigue. Resilin has remarkable elastic properties, with 97 percent efficiency in returning stored energy, and allows a release of energy beyond that of muscle power alone (Naskrecki 2004). The Caelifera are predominantly tropical but most of the superfamilies are represented worldwide. They are found in most types of non-marine habitats, as long as their are plants (Rowell and Flook 2001). While mainly terrestrial, inhabiting savannas, meadows, tropical forests, and so forth, many are found in marshes and other wetlands, and some are aquatic, such as Paulinia acuminata (Naskrecki 2004). Unlike the largely nocturnal ensiferans, the caeliferans are predominately diurnal. They tend to feed and mate during the day, but molt and lay eggs at night. Thus, one tends to hear the katydids sing at night, but the grasshoppers (short-horned grasshoppers) sing during the day. However, Cibolacris parviceps, a North American species, is an example of a member of Caelifera that feeds at night (Naskrecki 2004). Orthopterans tend to be solitary insects, but some members of Caelifera are notably gregarious, such as the locusts that can gather in huge swarms when in their migratory phase. A notable characteristic of orthopterans is the ability to produce sounds. Male caeliferans produce sounds to attract mates, to defend territory, and to raise the alarm of a predator. 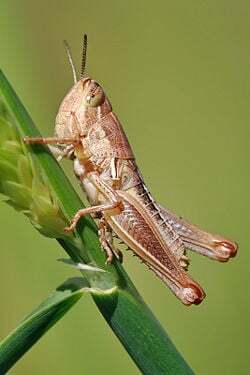 Unlike some of the crickets in the Ensifera suborder, which tend to utilize a narrow range of frequencies, grasshoppers produce mostly broad spectrum, noiselike calls. While male grasshoppers are mostly known for their ability to produce sounds by stridulation (rubbing one modified body part against another body part to produce sound), some grasshoppers can also make a crackling sound in flight, by flexing their hind wings rapidly (Naskrecki 2004). Almost all members of Caelifera are herbivorous, unlike the ensifera, which range from herbivorous to omnivorous to exclusively predaceous. Caeliferans may feed on angiosperms, gymnosperms, algae, mosses, ferns, roots, and so forth (Rowell and Flook 2001). Generally they feed on a variety of plants, but some are restricted to one or a few species of plants. For example, the Solanaceae are protected from many herbivores because they produce toxic compounds, but some grasshoppers, such as those in the subfamilies Ommatolampinae and Rhytidochrotinae, can frequent those plants (Naskrecki 2004). Unlike the nocturnal ensiferans, which depend on sound production to attract mates, the dirunal caeliferans also use visual displays, such as the members of the genus Syrbula that may perform a dance of 18 distinct movements. The short-horned grasshoppers may flash their colorful hind wings during flight, or other such courtship displays (Naskrecki 2004). Reproduction involves the transfer of a sperm sac, or spermatophore. In some groups, this is accompanied by the transfer of a spermatophylax, which is a large amount of nutritious proteins. Because this can be very large, as much as sixty percent of the body mass of the male, the males of many species are choosy in selecting mating partners (Naskrecki 2004). Recent estimates (Kevan 1982; Günther, 1980, 1992; Otte 1994-1995; subsequent literature) indicate some 2,400 valid Caeliferan genera and about 11,000 valid species described to date. Many undescribed species exist, especially in tropical wet forests. Naskrecki (2004) places the about 2,400 genera of short-horned grasshoppers into 22 families and 8 superfamilies. These superfamilies include Acridoidea (with over 7,200 known species and 1,600 genera of true grasshoppers and locusts), Pyrgomorphoidea (lubber and bush grasshoppers), Trigonopterygoidea, Tanaoceroidea (desert grasshoppers), Eumastacoidea (monkey grasshoppers), Pneumoroidea (bladder grasshoppers), Tetrigoidea (grouse or pygmy grasshoppers), and Tridactyloidea (pygmy mole crickets and sandgropers). Locusts are several species of short-horned grasshoppers of the family Acrididae that are characterized by having a swarming (gregarious) phase in addition to a solitary phase. These can be highly destructive and migrate in a more or less coordinated way. Locust swarms can cause massive damage to crops. Important locust species include Schistocerca gregaria and Locusta migratoria in Africa and the Middle East, and Schistocerca piceifrons in tropical Mexico and Central America (Mesoamerica). For example, the desert locust (Schistocerca gregaria) of Africa and Asia are normally solitary, but the spring rains trigger a behavior transformation that can result in single swarms larger than any other single congregation of organisms on Earth, ranging from 100,000 to 10 billion insects (Naskrecki 2004). Other short-horned grasshoppers important as pests (which, unlike true locusts, do not change color when they form swarms) include Melanoplus species (like M. bivittatus, M. femurrubrum, and M. differentialis) and Camnula pellucida in North America; the lubber grasshopper, Brachystola magna, and Sphenarium purpurascens in Northern and Central Mexico; species of Rhammatocerus in South America; and the Senegalese grasshopper Oedaleus senegalensis and the variegated grasshopper Zonocerus variegatus in Africa. Gwynne, D. T. and L. DeSutter. 1996. Ensifera. Crickets, katydids and weta. Tree of Life Web Project Version 01 January 1996. Retrieved November 10, 2008. Gwynne, D. T., L. DeSutter, P. Flook, and H. Rowell. 1996. Orthoptera. Crickets, kaytdids, grasshoppers, etc. Tree of Life Web Project Version 01 January 1996. Retrieved November 10, 2008. Naskrecki, P. 2004. Orthoptera. In B. Grzimek, D. G. Kleiman, V. Geist, and M. C. McDade. Grzimek's Animal Life Encyclopedia. Detroit: Thomson-Gale. ISBN 0787657883. Rowell, H., and P. Flook. 2001. Caelifera. Shorthorned Grasshoppers, Locusts and Relatives. Tree of Life Web Project version March 23, 2001. Retrieved November 15, 2008. This page was last modified on 27 December 2012, at 20:59.